A "sick" robot developed by researchers at Gifu University�s Graduate School of Medicine is providing hands-on educational assistance to future medical practitioners. When students touch its head and abdomen in places it feels pain, the robot says, "That hurts." With 24 sensors embedded in its head and body under a layer of soft, warm (near body temperature) silicone skin, the robot can detect the hand pressure applied by the examiner. 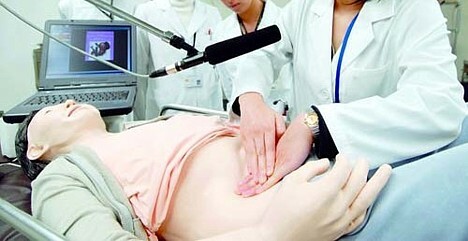 And depending on which of the 8 pre-programmed medical conditions -- which range from acute gastroenteritis to appendicitis -- it is suffering from, the robot provides a vocal response to the examiner's questions and manual pressure. Developers claim the robot helps students cultivate medical examination skills, and it is being used in classes beginning this academic year. The students appreciate the robot, claiming it helps improve confidence before performing examinations on real people. "Great pains were taken to provide the sensors with a human level of sensitivity," says professor Yuzo Takahashi (57), who developed the robot. "We would like to make further improvements and expand the number of symptoms the robot can respond to."